What, if you slept. And what, if you dreamt. And what, if in your dream, you see a strange and beautiful flower. And what, if you plucked it. And what, if you awoke. And what, if you have the flower in your hand. UTOPIA BLU is a cooperative architectural design firm primarily located in Amsterdam, NL. The creative duo of Philip H Wilck and Tiia Vahula focuses on design for 3D printing and creative fabrication. By using various digital tools numerous projects we are investigating cutting edge digital fabrication methods and limits of physical forms. 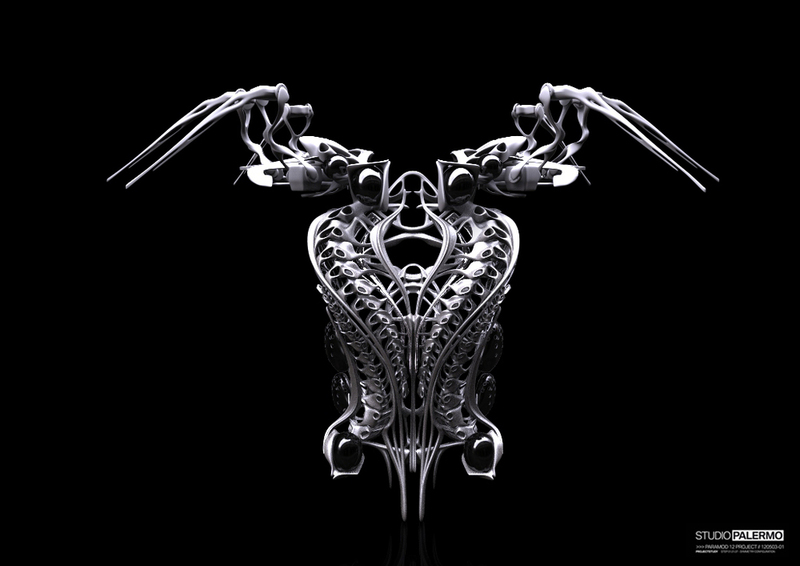 With merging complex geometry and technology we push the boundaries of arts and sciences and shape the future. Methodologies that engage complex and non-linear systems to generate emergent design. 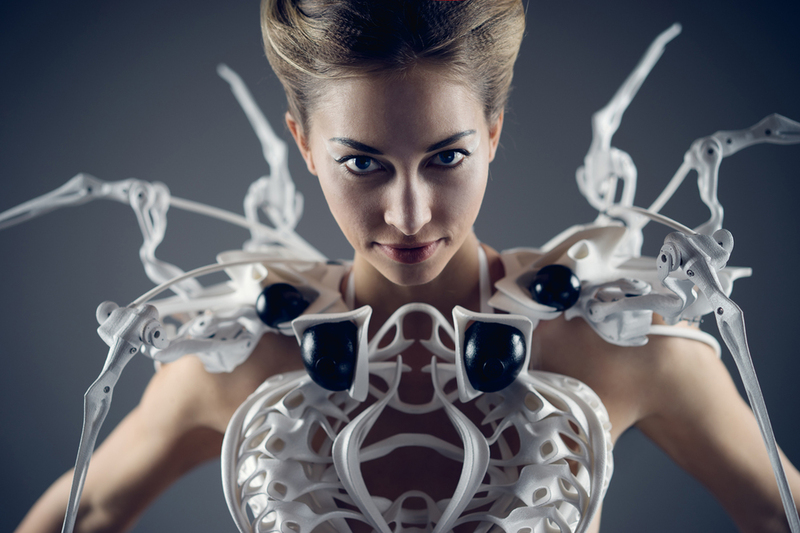 Intel Smart Spider Dress is not only scary but it intelligently defends its wearer. Techniques and concepts of non-algorithmic processes as means for design and fabrication. We're living in a super interesting era because normally you would have a fashion designer or an engineer or an architect, but now our generation is being really pushed to be it all, to be really interdisciplinary. 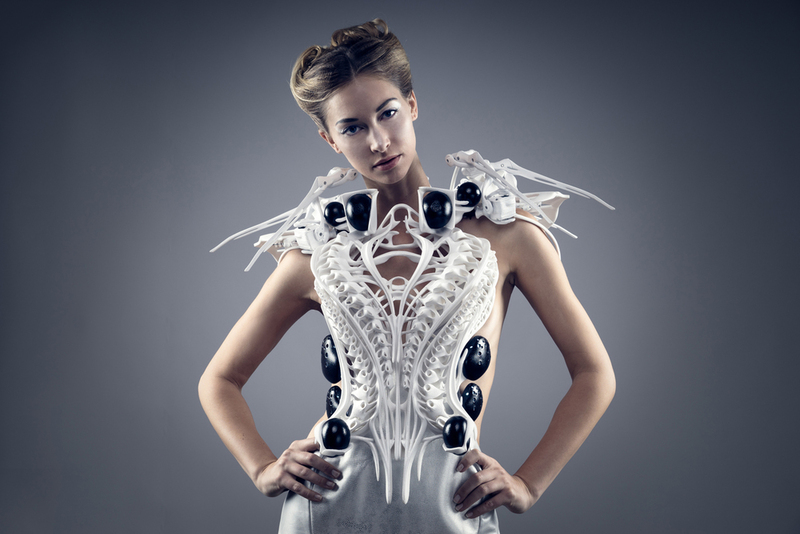 Anouk Wipprecht is known for creations such as the brainwave-monitoring Synapsedress, Smoke Dress, Intimacy 2.0, 3D-printed outfits for Cirque du Soleil and the dressFergie wore during the Black Eyed Peas live performance at Super Bowl 2011. She came to Intel last fall to work on projects that inspire innovation in wearable technologies beyond wrist and eyewear. She calls her one-of-a-kind Spider Dress “badass” for how it pushes and bends the boundaries of social norms. In collaboration with architect Philip H. Wilck of UTOPIA blu and the New Devices Group at Intel, this new design saw daylight in February 2015. Philip is a German architect. After receiving his first diploma in architecture with honors, in 2008, at University Augsburg (UAS), Germany, he joined the postgraduate program "Excessive" in 2010 lead by Hernan Diaz Alonso, at die Angewandte, Vienna where he gained his second master degree with distinction. Philip has since been working on numerous international project around the world. Tiia is an Estonian architect. She received her first Master of Science in Architecture in 2014, at Estonian Academy of Arts and Vienna University of Technology, Austria with Prof. Will Alsop. She joined the office from UNStudio in Amsterdam, Netherlands as a design architect and has been developing numerous international projects since.